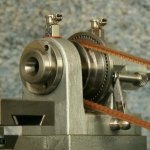 Accurate to within 0.005mm (0.0002"), this compact clock, watch and instrument makers lathe accepts 8mm horological collets in both headstock and tailstock spindles. Constructed from cast iron, steel and stainless steel, each machine is individually hand-fitted by an experienced enginner and a Test Certificate accompanies each machine. The 90 CW is mounted on a fully portable aluminium base with integral electronic speed controller. A one piece massive iron casting of cantilever form incorporating auto-traverse clutch box. The bed is dovetail in form and ground on all faces. A central Tee-slot provides a positive and accurate location of the tailstock. A gap in the bed allows for the swinging of a clock wheel up to a diameter of 120mm (4.725"). The cast iron saddle can be rapidly or sensitively traversed via the saddle lever feed (a leadscrew can be fitted if preferred). 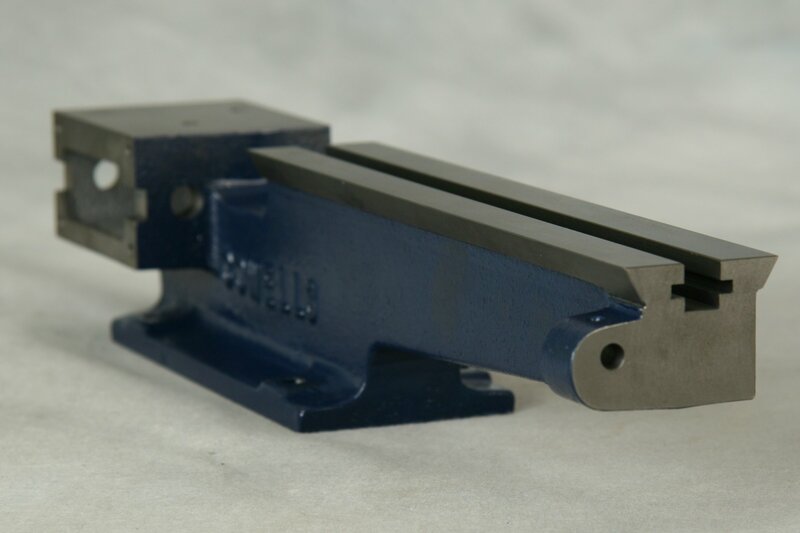 A long tee slotted cast iron crosslide permits the mounting of accessories such as the Vertical Milling Slide(RG55), Milling Head (RG85), Jacot Unit (RG59) and Roller Filing Rest (RG53) and may also be used as a table for in line boring. The crosslide has an etched angular scale 45° - 0 - 45° and carries the swivelling Topslide to permit taper turning. A quick change height adjustable tool holder is fitted. All slides are fitted with full length adjustable gib strips. Handwheels are stainless steel and are fitted with very accurate computer laser etched reset-to-zero calibration dials. The clearly marked dials are graduated in 50 increments of 0.02mm. The choice of Saddle Lever Feed or Manual Feed Leadscrew is a matter of preference; there is no price differential between either option. Cowells can supply either option as a retro-fit if required. The tailstock is cast iron, bored and honed to accommodate the hardened ground steel barrel. The barrel accepts the 8mm horological collet, which is secured in the conventional manner with a draw-in bar. The barrel is lever fed to facilitate high sensitivity drilling. Locking handles are fitted to both body and barrel. 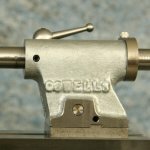 The tailstock may be off-set for the turning of long and shallow tapers. Tailstock lever feed aids sensitive drilling. The image to the right is an arbor being drilled whilst supported in the (RG59) Jacot Cone for re-pivoting. The cast iron headstock incorporates opposed cone phosphor bronze bearings front and rear with a hardened and ground steel cone running in the rear bearing.A fine threaded adjuster nut fitted to the rear of the headstock spindle acts upon the steel cone for the elimination of spindle end-float. This high quality bearing arrangement ensures longevity and spindle concentricity and eliminates 'tool chatter' and eccentricity so often found in machines fitted with small inferior ball bearings. The headstock spindle is hardened and ground and directly accepts 8mm collets and tooling. The typical T.I.R. (total indicated run-out) being 0.005mm (0.0002"). The spindle also incorporates a plain diameter and back face with 3 x threaded holes for the mounting of 3-Jaw Chuck(RG9), 4-Jaw Chuck (RG10) and Faceplate (RG28) via the Chuck Adaptor (G13) This method of fixing the 3-jaw chuck etc. 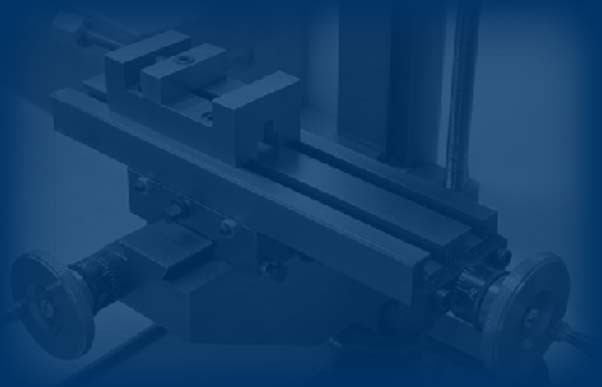 ensures accuracy and rigidity which can often be a problem associated with 8mm collet lathes. The headstock pulley has 60 index holes and a spring steel detent arm providing a direct headstock spindle indexing facility. The headstock is fitted with spring cap oilers to both bearings incorporating felt pads for the retention of lubricant. Each lathe undergoes a meticulous examination of its accuracy prior to delivery. Eight main tests are recorded on an Engineers Test Certificate. 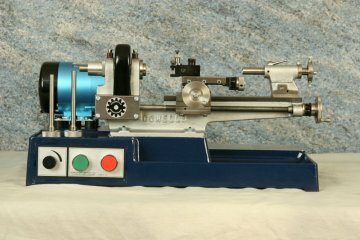 The certificate carries the lathe's serial number, is signed and dated and represents Cowells accuracy guarantee. Typical overall accuracy is 0.005mm (0.0002"). The lathe base unit is a one piece aluminium casting incorporating a drip and swarf tray designed for table top use. Cast hand-grips are provided for ease of portability, no fixing down or levelling of the base is required. The electronic speed control board and all electrics are isolated within their own compartment. The British manufactured 'Parvalux' motor has a 4000 rpm continuously rated output and is mounted on rubber isolation mounts. The motor is fitted with a single pulley with vee belt drive to the headstock. N.V. Safety switch gear is fitted with a raised red emergency stop button. To the rear of the base a machined platform area is provided for the mounting of auxiliary equipment such as the WheelΠnion Cutter motor unit (RG85). A fibreglass protective guard shrouds belts and pulleys. A range of arbors and adaptors are available (see accessory sheet) to permit the mounting of 3- and 4-jaw chucks, drill chucks and milling cutters. Typical accessories include Jacot unit with drums and cone plate (RG59), tip-over tool rest (RG58), roller filing rest (RG53) and WheelΠnion Cutter/Milling Attachment (RG85). A wide range conventional accessories are also compatible (see accessories). Written by A. Smith, C.Eng., the handbook is comprised of 127 pages taking the lathe owner from absolute basics through all main facets of turning and includes advice and instruction on the use of Cowells accessories. Full information covering care, maintenance and adjustments is provided. N.V. Contact safety push buttons green and raised red emergency stop. Potentiometer with anodised aluminium control knob. Centre height over bed - 44.45mm - 1.75"
Distance between centres - 203mm - 8.0"
Swing in Gap - 120mm - 4.7"
Swing over Crosslide - 47mm - 1.85"
Crossline Travel - 89mm - 3.5"
Topslide Travel - 38mm - 1.5"
Headstock- Direct internal acceptance of 8mm horological collets. Tailstock-Direct internal acceptance of 8mm horological collets. Height - 225mm - 9"
Length - 500mm - 20"
Breadth - 300mm - 12"
All Cowells machines are guaranteed for 5 years.